The average cost of assisted living in Lebanon is $3,310 per month. This is lower than the national median of $3,346. To help you with your search, browse the 16 reviews below for assisted living facilities in Lebanon. On average, consumers rate assisted living in Lebanon 4.1 out of 5 stars. Better rated regions include Antioch with an average rating of 4.2 out of 5 stars. Caring.com has helped thousands of families find high-quality senior care. To speak with one of our Family Advisors about assisted living options and costs in Lebanon, call (855) 863-8283. The leafy town of Lebanon, also known as “Cedar City," sits about 25 miles east of Nashville. Just over 16 percent of Lebanon’s 32,336 residents are 65 years of age or older, and those seniors have access to four assisted living facilities located nearby. 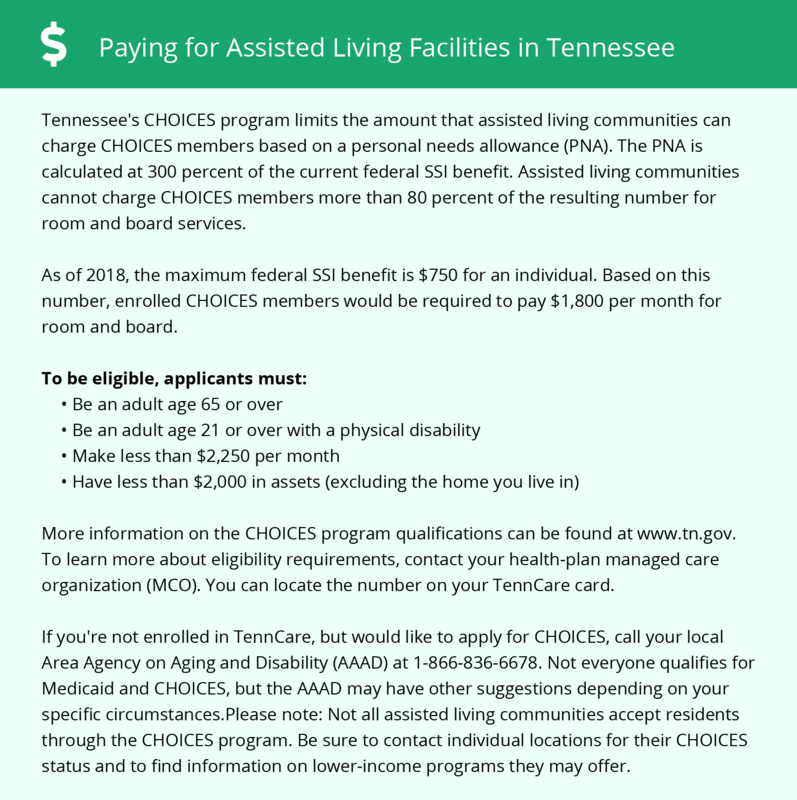 The state of Tennessee categorizes these communities as assisted care living facilities (ACLF), all of which are regulated and overseen by the Tennessee Department of Health’s Board for Licensing Health Care Facilities. In terms of affordability, Lebanon is on par with the national average. The cost of living is 99.1 compared to the national average of 100, and only housing costs exceed that 100-point benchmark. Lebanon has relatively mild winters, with temperatures reaching a low of 27 degrees Fahrenheit in January and a mere three inches of snow annually. Summers, on the other hand, are hot and wet, which might prove troublesome for seniors who are negatively affected by heat and humidity. Crime rates are high in Lebanon, which may be concerning for seniors searching for a safe place to live. Violent crime in the city is ranked 65.9 out of 100 versus the national average of 31.1, while property crime is 55.1 in Lebanon compared to an average of 38.1 across the U.S. The Mid-Cumberland Human Resource Agency (MCHRA) operates a rural public transportation service that offers curb-to-curb rides to seniors and other eligible individuals in need of transport to medical appointments, grocery stores and other important destinations. Seniors looking for regional transportation into Nashville can hop on the Music City Star at a significantly reduced fare. The Lebanon area is home to world-class medical facilities, including Tennova Healthcare–Lebanon, in the event of medical emergencies or illness. Lebanon has an array of community resources for seniors, including the Council on Aging of Middle Tennessee, which offers everything from senior transportation to caregiver education, and at least one senior center. Assisted Living costs in Lebanon start around $3,310 per month on average, while the nationwide average cost of assisted living is $4,000 per month, according to the latest figures from Genworth’s Cost of Care Survey. It’s important to note that assisted living rates in Lebanon and the surrounding suburbs can vary widely based on factors such as location, the level of care needed, apartment size and the types of amenities offered at each community. For low-income seniors interested in obtaining financial assistance for assisted living, there is currently one option. The CHOICES program is designed to help seniors at risk of nursing home placement find suitable alternatives, including in-home nursing and assisted living placement. Lebanon and the surrounding area are home to numerous government agencies and non-profit organizations offering help for seniors searching for or currently residing in an assisted living community. These organizations can also provide assistance in a number of other eldercare services such as geriatric care management, elder law advice, estate planning, finding home care and health and wellness programs. To see a list of free assisted living resources in Lebanon, please visit our Assisted Living in Tennessee page. Lebanon-area assisted living communities must adhere to the comprehensive set of state laws and regulations that all assisted living communities in Tennessee are required to follow. Visit our Assisted Living in Tennessee page for more information about these laws.